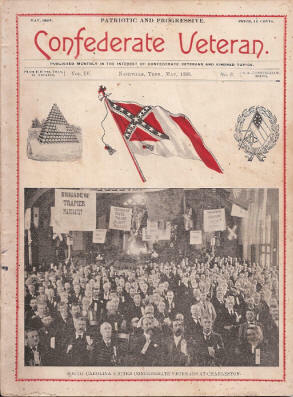 Confederate Veteran is a magazine about veterans of the Confederate States Army during the American Civil War of 1861-1865. The magazine can be an important research source. There are articles of battle descriptions and other historical events as well as items of genealogical interest. There are lists of subscribers for Confederate memorials wherein you can locate an ancestor in a certain time and place. There are many photographs, anecdotes and personal histories. After choosing the volume of the magazine at the above site, you will be taken to the Archive.org display of the volume . Use the "Search Inside" option on the right side in the middle to search within the volume. There are several download options at this site.